Nadia is an expert in corporate communications and workplace DEI. Prior to joining Vaya, Nadia served as Communications Program Manager for GitHub, a globally distributed software development platform and industry leader in corporate diversity and social impact initiatives. In their role at GitHub, Nadia designed and implemented new internal communications programs; planned and produced monthly all-hands, town halls, AMAs and other events; produced internal video content; and crafted clear executive narratives to circulate among more than 900 employees, 65% of whom were part of the company’s distributed international workforce. 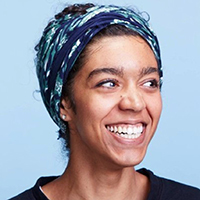 Prior to GitHub, Nadia led communications for CODE2040, where they developed and implemented brand, PR, speaking, fundraising, and external communications strategy. Nadia is a lecturer on design thinking and advisor to the University Innovation Fellows at Stanford University, and received a degree in social entrepreneurship from Converse College.